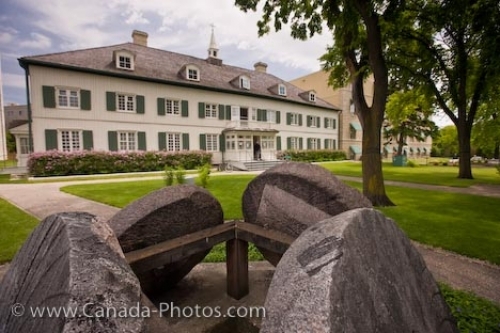 The grounds and exterior of the Saint Boniface Museum, the former Grey Nuns Convent in St. Boniface in the City of Winnipeg, Manitoba. The Saint Boniface Museum, formerly the Grey Nuns' Convent, is the oldest building in the City of Winnipeg in Manitoba, Canada. This historic building was built between 1845 and 1851 for the Grey Nuns who came to the Red River Colony and is now home to the museum which carries a unique collection of artifacts relating to the French Canadian and Metis heritage of Manitoba. Previous to the days of the museum, the building was used as a hospital, a school and boarding school and a place to call home for the sick and poor. The Saint Bonafice Museum is open year round to the public with spring and summer being the prettiest seasons to wander the immaculate grounds. Saint Boniface Museum, the former Grey Nuns Convent, St Boniface, City of Winnipeg, Manitoba, Canada. Picture of the Saint Boniface Museum and its grounds in St. Boniface in the City of Winnipeg in Manitoba, Canada.